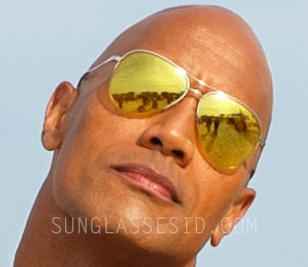 Dwayne Johnson's Sama Syd "Bay Elite" gold aviator sunglasses were created especially for him in the Baywatch movie. 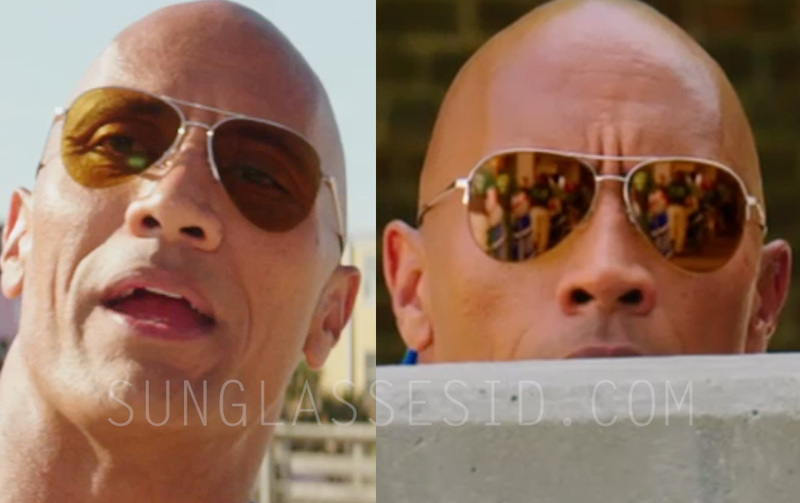 Dwayne Johnson wears a pair of Sama Syd "Bay Elite" gold aviator sunglasses in the Baywatch movie. Dwayne Johnson wears a pair of Sama Syd "Bay Elite" gold aviator sunglasses in the 2017 Baywatch movie. These sunglasses were custom designed for Dwayne Johnson by Sheila Vance, with direction from the film's costume designer Dayna Pink. The glasses are a new take on the aviator. The name of the glasses, SYD, was originally the acronym for the secret project: the team at Sama Eyewear ​used S.Y.D. - "Special Yellow Dwayne" -​​ to refer to the aviator being crafted for the big screen​. The color choice, its mirrored effect and anti-reflective coating was ideal for look for the super​-​star hero of the beach for ​the ​ fun in the sun summer shooting in Miami over 3 months in 2016. According to designer Sheila Vance ​the custom tone took about a dozen custom color compounds to craft the ideal hue, ​and was selected to reflect well against the ​water​ and sand color, work with the red and blue tones of the lifeguard suit​ and capture the ​subtle tones of the sun from sunrise to sunset. ​A retail version of these glasses will be available for sale at Destination: Sama stores and online for summer 2017. In the same film, Johnson's co-star Zac Efron wears a pair of Randolph Engineering Aviator sunglasses.